Sabudana or sago is a man-made starch extracted from cassava or tapioca roots. This starch is then processed to form small balls or spheres. Sabudana is also known as sago or tapioca pearls. It provides energy and is frequently used during religious fasting, when other grains are prohibited. Sabudana is generally soaked in water for 4-5 hours to overnight before it can be cooked. Sabudana will fluff up upon soaking, after which it can be used in various recipes. Sabudana pearls can be of varying size, so they may take different times for soaking. Some may get soaked in just about 3-4 hours, while other qualities might take upto 8 hours. Is sabudana good for babies? Sabudana is a simple starch, which is very easy to digest. It also provides quick energy, thus is a good first food for babies. It is rich in protein, calcium and other minerals. It is also a filling food and keeps baby full till the next meal. 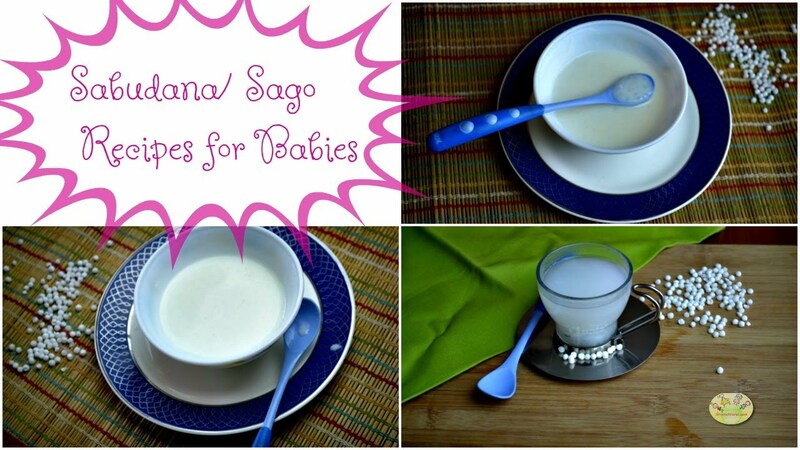 We are sharing 5 simple sabudana recipes for babies here today. Sabudana is rich in starch, so this makes it a good first food for babies which makes it energy-giving and easy to digest. You can give this occasionally along with other regular cereals like rice, khichdi etc. Wash and soak sabudana in clear water for 4-5 hours. If your sabudana takes longer to soak, then you can even leave it overnight. Heat a pan and heat 1 cup of water with 2 table spoons of soaked sabudana. Let this cook till sabudana starts looking translucent. Cool it down a little. Take the cooked, soft sago and mash it down to a smooth consistency. Add more water to thin it down if you need. You can also add 2-3 drops of ghee to this too. Cook the sabudana in the same way as in sabudana water. Add a few teaspoons of formula or breast milk to make it a porridgy consistency. This porridge is a good occasional option for baby. Soak the sabudana for 4-5 hours. Cook the sabudana in 1/2 cup water. Add 1 cup milk and cook for 5-10 minutes till sago is completely cooked and translucent. Cook the kheer on slow to medium heat. Add crushed cardamom or cardamom powder to the kheer. Add sugar and chopped nuts. Let the kheer cool down a little before serving to child. Wash and soak moong dal for 15 minutes. Add asafoetida and cumin seeds to ghee. When cumin seeds start spluttering, add washed moong dal. Roast moong dal for few seconds. Add green peas and saute for a few seconds. Add about half cup water and bring to a boil. Add a pinch of tumeric powder and salt according to taste. Add more water if needed, cover and let the dal cook for 8-10 minutes on medium heat. Once dal is about 70% cooked, add sabudana. Mix well and let the khichdi cook for another 5-8 minutes till dal and sago is completely cooked. Serve it warm with some ghee on top if you like.